Inland water sources have dried up, drinking water is scarce and crops have been destroyed in nine provinces where nearly 900,000 Sri Lankans are suffering due to the continuing drought. But disaster management officials say the drought in the nine provinces is not too serious. At least 844,669 people from 242,982 families in the North, East, North Central and North Western provinces have been badly affected by the lack of seasonal monsoon rains. The North and Eastern provinces are the worst affected, the Disaster Management Centre said. Northerners do not have enough drinking water. Wells have dried up. The Jaffna District Secretariat is providing drinking water through water tankers. Officials said islands in the North face severe shortage of drinking water because groundwater is depleted. According to Jaffna District Secretary, N Vedanayahan, some 123,433 people from 34,049 families have been affected. “We have been providing water to coastal areas and islands for some time, but the drought made things worse. There was a significant impact on farmers and livestock owners. We have informed the government and we hope to provide relief once procedures are cleared,” he said. 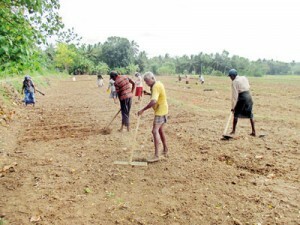 The drought is continuing in Anuradhapura, Puttalam and Kurunegala districts. Mullaitivu is severely affected. Thousands of acres of Yala cultivation have been laid to waste. Fishermen who engaged in lagoon fishing are also suffering. In Mullaitivu, too, drinking water is a serious concern. Arrangements have been made by the Mullaitivu District Secretariat to provide drinking water. “The secretariat has collected details of those who have been affected by the drought and sent it to the Disaster Management Centre. We are yet to be directed by the government on issuing grants or rations to those affected,” Mrs R Ketheeswaran, the district secretary told the Sunday Times. Details of farmers whose crop has been destroyed are now being gathered. At the moment, drought relief for those who were affected in the Maha season last year are being paid compensation by the government. Fish have died from oxygen depletion in the lagoons of Nandikadal and Vadduvaakal. Experts from the National Aquatic Resources Research and Development Agency have pointed to the lack of oxygen in the lagoon waters for the mass deaths. The drying up of lagoons have hit the livelihoods of fisherfolk in Mullaithivu who use the ‘theppam’ or ‘kulla’, the tiny wooden fishing boats, to make a living. The Mullaitivu Fishermen’s Federation, head, Anthonypullai Mariyarasa, said at least 4,600 fisher families have been affected. “Those who can operate deep sea vessels are switching from traditional fishing because they had no choice. But most don’t have such resources. They are poor. We have informed the fisheries department but there is no relief, so far,” he said. The deputy director of the Disaster Management Centre, Pradeep Kodippili expects the drought in the North and Eastern provinces to ease with the arrival of seasonal monsoon rain in the coming weeks. “The drought situation in the North is not that serious,” he claimed.